Are you looking for a unique ornament to add to your Christmas tree this year? Why not use your own one-of-a-kind photos and dress up your holiday décor. Our glass ornaments will certainly fit the bill, adding a simple, yet modern flair to your holiday decoration collection. Choose from various photo layouts and showcase a variety of your favorite family pictures and cherished photographic moments to share with your friends and family throughout the holiday season. 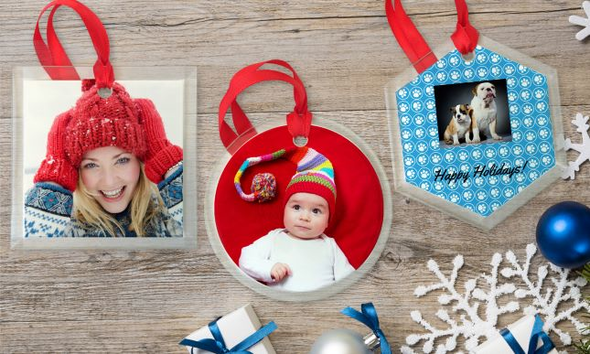 Make this holiday season stand out with a unique photo ornament and decorate your home with some of your most treasured moments. With our glass photo ornaments you can add a touch of color and personality throughout the house. Create a collection of glass ornaments displaying your favorite family photos and use them to embellish your Christmas tree. Adorn a mantle, side table or shelf in minutes by hanging your glass ornaments from an ornament tree. With so many options, your custom photo glass ornaments will make the perfect addition to any holiday display. After uploading your photos to MailPix, select from three glass ornament shapes including square, round and hexagon. Showcase a special photo using our full bleed option, or print a collection of photos using one of our many photo layout options. Choose from a wide variety of background colors and patterns to match your home décor. When your ornament arrives, it will include a complimentary red satin ribbon so you can easily hang it anywhere in your home. Each ornament is 1/8 thick and has an attractive clear glass beveling on each side that is perfect for a modern holiday look. Whether you are looking to share your photos with friends and family during the holidays, or find a unique gift, our glass photo ornaments will certainly fit the bill. Use them to add color to your home this season and show off a collection of family portraits, candid snapshots and momentous occasions throughout the year. Customize them with your own text and find the perfect photo that a friend or relative will love. A customized photo ornament will make an amazing gift that won’t soon be forgotten.